On Celebrating Labor – Labor Day seems to be the most misunderstood of our national holidays, and thus never seems to get the respect it deserves. To me, Labor Day was always just a long weekend marking the unofficial end of summer, a day I celebrated with family and friends in our backyards, drinking sangria and lamenting about how fast another summer had flown by. But a closer look at the origins of Labor Day, and the people who have fought for the rights of our country’s most valuable asset – our workforce – reveals that Labor Day deserves much more respect than it receives. These tensions reached a boiling point in May 1894 when employees of the Pullman Car Company went on strike to protest wage cuts and the firing of union representatives. In response, the American Railway Union called for a nationwide strike of all Pullman railway cars, resulting in over 125,000 workers walking off the job. This effectively shut down the railway system nationwide, causing severe economic hardship throughout the country. The U.S. government obtained an injunction to force the workers back to work, but they refused, so President Cleveland ordered thousands of U.S. Marshals and 12,000 Army troops into Chicago to enforce the court’s order. The chaos resulted in the death of up to 30 strikers and injury to many more, as well as over $80 million in property damage. By August, Pullman had reopened and rehired the striking workers, subject to their signed pledge that they wouldn’t join a union. As we head into this Labor Day weekend, we should reflect on the strife and unimaginable conditions that working Americans before us endured. These Americans, many of whom were paid pennies, built an infrastructure that has enabled the United States to grow its GDP by 35,000% since 1870, creating the greatest economy in the history of man. Those workers lived in poverty, residing in overcrowded and unsanitary tenements, or many times inside the factories where they worked, while folks like Rockefeller, Vanderbilt and Getty amassed unconscionable amounts of wealth. Certainly, there is still work to be done to improve working conditions for many Americans and people around the world. But this Labor Day weekend we should all make a toast to those American workers who sacrificed so much for so little. This week’s wine is 2016 The Snitch Chardonnay ($29.99). This Chardonnay was a total delight. With a bouquet of apple and banana, the finish was light and slightly oak with a vanilla and buttery mix. It paired very well with a smoked gouda with truffle cheese, along with brie with fig jam. All in the Family – I enjoyed a great meal last weekend at Starr Boggs in Westhampton Beach with my cousin Gary Bercarich, owner of Gary B Home Improvements, and his lovely wife, Susan. Thank you to Gary and his talented construction team for graciously sharing their time and expertise earlier this month for our CMM Cares Day beautifying homes for United Veterans Beacon House. 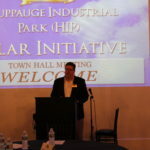 It’s the Economy, Smithtown – I participated in a terrific meeting last week focused on the Hauppauge Industrial Park and the best way to maximize the opportunities in our own backyard. Smithtown Supervisor Ed Wehrheim welcomed us to his office where representatives from the Town, HIA-LI, Suffolk IDA, and James Lima Planning + Development addressed building the modern workforce. Supervisor Wehrheim is committed to our efforts to invest in the Park and his administration has already taken important steps in that direction. Leadership Committee – This year at CMM we put together a Leadership Committee with emerging leaders representing the various departments at the firm. I enjoyed our meeting last week where we did some leadership training and had an open discussion on many issues. I’m very proud of my team and I look forward to our Leadership Retreat this fall. America’s VetDogs – I was happy to support America’s VetDogs at their golf outing earlier this week with my friends John Miller, President & CEO of America’s VetDogs and the Guide Dog Foundation, and Scott Maskin, President & CEO of SUNation Solar Systems. America’s VetDogs provides a critical service to veterans, active-duty service members, and first responders with disabilities by giving them renewed independence. Check out my trophy for First Place – Open Scramble! Hear more from John Miller about America’s VetDogs here. HIA-LI – I was happy to host the HIA-LI board meeting here at CMM this week. There are so many great programs and initiatives coming up this fall – stay tuned. Enjoy the remaining days of summer!